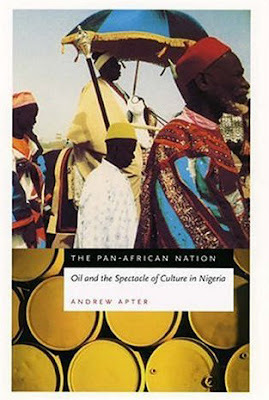 I'm reading Andrew Apter's excellent The Pan-African Nation: Oil and the Spectacle of Culture in Nigeria. Chapter 5 (available in pdf here) examines the role of the Durbar horse pageant in the formation of national identity, reaching its apogee as an essential element of post-imperial 'national' culture during the Kaduna durbar that formed part of the 1977 FESTAC celebrations. Rather than attempting to devise a pure linear historical path, the chapter traces parallel and interconnecting lines of descent - a complex and pluralised genealogy he couches in terms of the mother and father's lines. On the one hand, he rehearses the exogenous history of the Durbar in colonial India which the British imported into Nigeria via Lord Lugard's durbar at Lokoja on Jan 1st 1900 (signalling the end of the Royal Niger Company as an independent militarised force and the commencement of the Protectorate of Northern Nigeria). On the other hand, Apter traces elements of an internal history, via the Hawan Dawaki, the Jukun Puje festival etc. He successfully shows how the colonial/imperial elements of the Durbar were appropriated as part of a resurgent national (and pan-African) culture by the time of the 1977 petronaira-funded festival. The very act of this appropriation formed part of a retrenched northern hegemony, articulated in cultural terms. In other words, the essay is an excellent account of the relationship between culture and power through the emergence of the Nigerian post-colony. Given the power that culture has to constitute/invent a tradition and form the basis of a re-imagined national identity in the terms Apter sets up, one might therefore contextualise the failure of the Abuja carnival as part of a more general failure to re-imagine Nigerian identity in contemporary terms. It highlights the argument I have raised many times on this blog about the importance of re-connecting the social imaginary with its cultural origins, not as part of a nostalgic/conservational project, but as a means to reformulate identity in the language of the present and the to-come. I love Durbar. I have a friend from Bulgaria called Durbar. When I told him about Durbar in Nigeria, he said he would visit. Totally random and irrelevant, I know! An excellent book that show how most of the things that divide Nigerians are in themselves recent social constructs. Enjoyed it so much. It is an excellent scholarly as well as entertaining book.